Laser tattoo removal. It is highly advisable to read the general section on tattoo removal before studying this section focusing on laser tattoo fading. Lasers have been used for this aesthetic application over several years. Tattoo fading lasers are very easy to use and the intensity of the treatment is not dependent on the way the device is used during the treatment itself. This is because as we will see the intensity of the treatment is largely determined by the setting of the device and not by the way the laser is operated. This makes laser tattoo fading devices relatively easy to use. There is little error related to the way the laser is then used during the treatment. The only mistake which can be made is overlapping the lasers burst on the tattoo while operating the device. However, this is very easily avoided as the operator can appreciate the frosting caused by the laser and avoid treating the area again. Laser tattoo fading treatments are widely advertised as tattoo removal treatments. They are the most popular method to fade tattoos in most western countries. These aesthetic treatments only last a few minutes, are straightforward to perform and the price per minute for this type of treatment is relatively high. Therefore very profitable to the cosmetic clinics performing them. This is because the duration of the treatment per se is very brief and the price charged for treatment is relatively high (because the clientèle is usually highly motivated to have their tattoo faded or removed). Also, several numbers of treatments are required to achieve satisfactory results making the cumulative total amount charged relatively high. Both the ever increased demand and the profitability of these treatments to clinics have made laser tattoo fading treatments the most popular aesthetic treatment for this application. The fading results are relatively easily recognised after the first few sessions when the least resilient colours have faded most. Furthermore, the common perception that the use of lasers in aesthetics "utilises the latest cutting-edge technology" therefore safe and effective has contributed to the rise in popularity of this type of treatment. The main characteristic of lasers is their capability of emitting a coherent light source at a predetermined frequency (or wavelength). Lasers can also emit a number of different frequencies. The difference between sunlight, including most other artificial light sources and lasers, is that lasers can only emit light at predefined discrete wavelengths. Most lasers can only operate at one predetermined frequency at a time which is set by the laser operator. Lasers are also designed to emit a discrete number of frequencies at a time (multi-frequency/wavelength lasers). The wavelength can be one or multiple but a laser can never emit broadband light energy like most other artificial light sources and other aesthetic devices (e.g. IPL devices). Multi-frequency lasers are also used for tattoo fading and are advertised as very effective tattoo removal devices. This is because the combination of different wavelengths can bring better fading due to the different penetration of each wavelength and the different effect of each wavelength on each tattoo colour. However, in any case, the main difference between lasers and most other natural or artificial light sources is that the lasers, although can emit a different number of frequencies at a time, cannot emit broadband light. Due to this peculiarity of lasers and the different way each wavelength gets absorbed by the skin, lasers have a broad array of applications in skin treatments. Different wavelengths are absorbed differently by the skin and different penetration of the skin lead to different results and hence different applications are aesthetics. The depth of the light penetration into the skin is mainly determined by the frequency emitted. The higher the frequency the more superficial the effect of the laser on the skin and the less the light will penetrate inside the skin. Conversely, the lower the frequency the more deeply the light will penetrate inside the skin. This figure illustrates the way light propagates inside the skin. The shorter wavelengths (blue-green) have only a superficial ablation effect, while the longer wavelengths (red and infra-red) penetrate more deeply into the skin. The higher the wavelength (the lower the frequency) the deeper the penetration of the specific wavelength. This is one of the reasons for the high versatility of lasers. This physical phenomenon allows lasers to have several applications in aesthetics, for example, they are used in skin resurfacing, permanent hair removal, tattoo removal etc. The type of treatment is mainly determined by the frequency, the light intensity and other factors. The above wavelengths are those which produce the typical frosting effects during laser tattoo fading and other laser aesthetic treatments. The figure above shows how different wavelengths get absorbed by the skin. Generally, the higher the frequency (lower wavelength) the more superficial the effect of the light onto the skin. Higher frequencies light energy to have a relatively low rate of penetration and its action is relatively superficial. Conversely the lower the frequency (higher wavelength) the deeper the penetration of the light radiation into the skin. Therefore in order to accomplish the desired results the appropriate wavelength can be used for any given type of desired aesthetic result. The difference in the way any given wavelength propagates inside the skin makes lasers extremely useful and versatile devices. This is because in most cases the user can simply change the nature of the aesthetic treatment by varying the wavelength of the device along with other parameters. For example in order to perform a very superficial ablation (e.g. removing superficial skin imperfections, moles, birthmarks, benign lesions or performing a very superficial skin peels) the wavelength used is relatively high (over 420 nm/blue or violet). At these high frequencies, the burning, as well as the skin resurfacing effects, are very superficial. 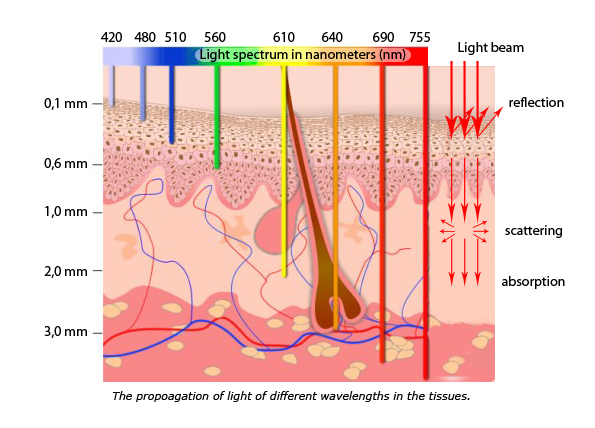 For example, if lasers are used for permanent epilation (permanent hair removal) the degree of light penetration required is a level deeper (orange). This is because in permanent hair removal the laser has to destroy the hair follicle rooted in the dermis. Therefore the laser light has to affect the deeper parts of the dermis where the root of the hair follicle resides. Therefore the wavelength used is lower (in the region of 600 nm or over). In case the aesthetic treatment demands a deeper level of penetration, then the radiation (light) frequency is lowered. Although lasers can be used for permanent hair removal the devices widely used for this application are IPLs. In here, we can appreciate the main difference between lasers (a monochromatic or discrete multi-chromatic light source) and IPL devices (Intense Pulsed Light) generating a broadband light source which has a multi-level of penetration into the skin. The main application of IPL devices is permanent hair removal. Likewise in case of deep skin resurfacing and laser skin tightening, we are trying to heat up the dermis in order to trigger collagen regeneration. In these case we are looking for deep penetration effects, hence the wavelength chosen can be over 700 nm (red or infra-red). It should be very clear now why Lasers are so versatile used in several skin applications and aesthetic treatments. This is because by varying the wavelength/s emitted along with other few parameters the nature of the treatments changes dramatically. However, this is an oversimplified description of the way laser lighting penetrates into the skin. There are several other parameters which play a role in the effect of light energy into the skin. One of them is the diameter of the light beam used. Generally the larger the diameter of the light beam the deeper the penetration into the skin conversely the smaller the diameter the more superficial the penetration. The depth of light penetration into the skin is also related to the diameter of the light beam. Generally the larger the diameter the deeper into the skin the light penetrates. Conversely the smaller the diameter the superficial the penetration. The graph on the right shows how this phenomenon varies with the wavelength used. The red line shows how lower frequencies (1064nm) can penetrate more deeply by increasing the light beam diameter. The yellow line (532nm) shows how the higher the frequencies have less degree of increase in penetration while increasing the diameter. Spot size, or the width of the laser beam, affects treatment. Light is optically scattered in the skin, like automobile headlights in fog. Larger spot sizes slightly increase the effective penetration depth of the laser light, thus enabling more effective targeting of deeper tattoo pigments. Larger spot sizes also increase the treatment intensity and help achieve the desired tattoo fading effects faster. only setting the intensity and the impulse of the light emission on the device (this is typical of deep skin tightening laser treatments where the "frosting" effects are not visible). This is the case where the frequency of the laser is very low hence the light penetration into the skin is so deep that it is not possible to appreciate the burning effect of the laser visually. This method relies on varying the intensity of the lighting emission and duration of the pulse (see Q-Switching) while having a visual appreciation of the immediate effects of the laser ablation ("laser frosting"). It is important to realise that the intensity of the treatment is mainly determined by the setting of the device and the visual appreciation is mainly used to make sure the treatment effects are not accidentally exacerbated by overlapping the laser ablation. This method is normally used for removal of benign moles, correction of skin imperfections, superficial laser skin resurfacing treatments as well as laser tattoo removal. The laser operator controls the ablation effects in two ways, both by varying the settings of the device and visually by appreciating the frosting effects on the skin. An example of appreciating visually the immediate ablation effects caused by the aesthetic treatment during skin resurfacing is shown in the following video. The frosting effect is immediate and it provides the operator with an appreciation of the treatment intensity performed on the client. The user can control the intensity of the light beam by varying the settings of the laser device as well as having a direct visual appreciation of the immediate effects the laser has on the skin. Also, another example of where the intensity of the treatment is also appreciated visually by the operator during the treatment is the classic laser moles removal. In the video below we can appreciate how the treatment is directly controlled by the operator by repeating the laser ablation during the mole removal procedure. On the other hand, when the laser ablation or the heating effect is required to be performed deeply into the skin, the operator has no way of visually appreciating the immediate ablation (burning) effects on the skin. For example, in deep laser skin tightening, the effects of the skin treatment are not immediately visible (with frosting or other immediate visible skin reactions), therefore the treatment has to be calibrated only according to previous experience. The treatment intensity is determined by setting the light intensity and duration of the laser pulse. The longer the duration of the laser pulse the higher the intensity of the treatment, conversely the shorter the pulse the lower the treatment intensity. In these types of laser skin treatments effects of the treatment (redness and swelling) only become visible one or two days following the aesthetic procedure. In these cases, the treatment intensity is only predetermined by calibrating certain settings of the laser device itself. As an example of low frequency and deep penetration, treatment is the use of a deep laser for skin resurfacing. In the video below we can see an example of deep Laser skin tightening treatment. This is a typical example when the intensity of the treatment is set by regulating certain parameters and there is no direct immediate appreciation of the effects of the laser on the skin. Laser tattoo removal or more appropriately laser "tattoo fading" work by causing a controlled skin burn in order to fade the tattoo pigments. As we know the tattoo pigments are located inside the dermis. Therefore in order to fade aesthetic tattoos using lasers or any other method a degree of dermal ablation will be inevitably required. 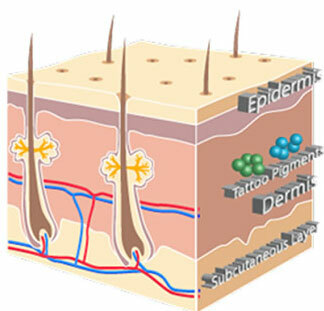 As seen previously the tattoo pigments are located inside the dermis (for more information please click here). Hence in order to reach the tattoo pigments and fade the tattoo, a degree of dermal ablation will be necessary regardless of the method used to fade the tattoo, including laser treatments. If you are familiar with superficial laser skin resurfacing and the basic principles of laser skin tightening, you will notice the similarities with laser tattoo removal procedures. Like in laser skin resurfacing and laser skin tightening, the laser causes an intentional dermal burn. The main difference in tattoo fading is that the laser device is calibrated in a slightly different way and generally the intensity of the treatment is higher than normal laser skin resurfacing. In laser skin resurfacing (or laser skin tightening) the laser has to heat up the dermis, the same principle applies to laser tattoo fading. It is the heat (or burn) caused by the laser light that triggers the skin resurfacing and skin tightening. In a similar fashion, the laser treatment speeds up the absorption of the tattoo pigments in stages, both by breaking down some of the pigments and by triggering the skin regeneration caused by the dermal burn inflicted by the laser. The physics that apply to laser skin resurfacing also apply to laser tattoo fading. As we see in this simplified representation of laser skin resurfacing, the laser light penetrates into the dermis. It is the heat (or burn) caused by the laser light that triggers the skin regeneration and skin tightening. Similarly to laser skin tightening, during the tattoo fading treatment, the laser causes a dermal ablation which triggers the dermal skin regeneration process, also partly scattering the tattoo pigments. After each treatment, part of the pigments tends to be reabsorbed by the immune system. Some manufacturers advertise selective ablation (burn) targeting of the tattoo pigments, however in any case the laser energy is absorbed by the skin as a whole and not only the tattoo pigments. This is demonstrated by the fact that the skin burn is generated anywhere the laser light is applied and not only on the tattooed area. 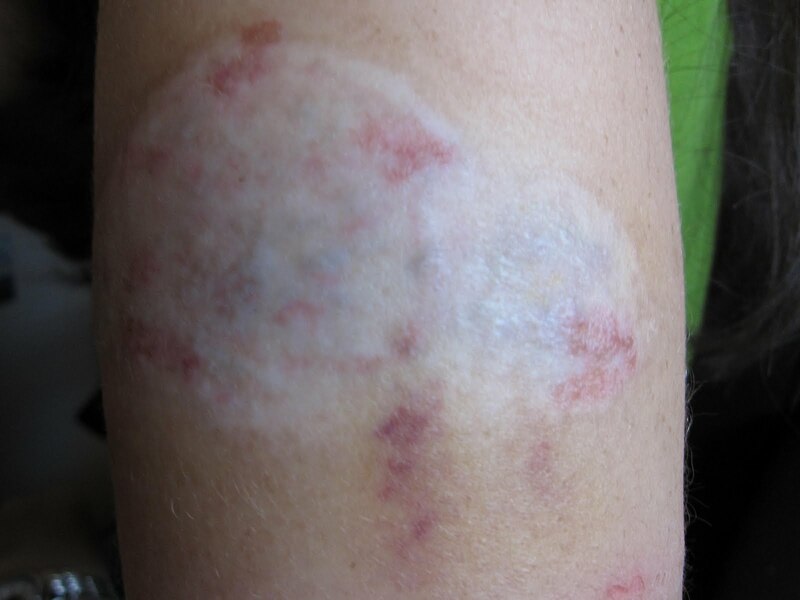 In case of laser tattoo fading the skin burn is generalised across the treated area as demonstrated by the blistering which forms one or two days after the laser ablation. Unfortunately, there is no currently known tattoo removal or tattoo fading treatment which can selectively target the tattoo pigments during laser treatments. In other words, there is no aesthetic treatment capable of selectively destroying the tattoo pigments alone without also affecting the dermis in one way or another. This figure illustrates the basic principle of laser tattoo fading. This is an oversimplified model to illustrate the basic working principle of laser tattoo fading. Part of the light is absorbed by the tattoo pigments and they are partly broken down. The scattered ink is absorbed by the immune system. Not all tattoo ink can be broken down by the laser during the treatment, only a part of the tattoo is absorbed after each session. The figure below is another oversimplified representation of the laser tattoo fading process because not all wavelengths are absorbed by the dermis at the same depth and in the same way. Lasers can only emit a discrete (finite) number of wavelengths and each wavelength gets absorbed differently by the skin. The deeper the tattoo pigments the harder it will be to break them down without causing some degree of thermal dermal permanent damage (hence permanent adverse effects). This is because in case of very deep pigmentation, most of the laser energy is absorbed by the epidermis and the upper part of the dermis and only a smaller proportion of light is absorbed by the tattoo pigments. Only red and infra-red wavelengths can reach the lower part of the dermis, however even their energy will be partially absorbed by the upper dermis and only a fraction of it will reach the deeper dermis and hence the deep pigments. Normally these wavelengths (red and infrared) are used for deep laser skin resurfacing, laser skin tightening and permanent hair removal. This is another representation of laser tattoo fading or laser skin resurfacing. We also refer to this process as laser skin resurfacing and this is also a representation of the way the laser light penetrates into the skin for laser skin resurfacing and laser skin tightening. On the left, we can see the tattoo pigments, in the middle an oversimplified representation of the laser tattoo fading treatment. On the right, we can see a representation of the "scattered'" pigments. This is an over simplified representation also because, as we know, lasers can only very seldom scatter all the tattoo pigments within one session especially if the pigments are located particularly deeply inside the dermis. Below we have yet another representation of laser tattoo pigments fragmentation. Once again this is another oversimplified representation of the complete fragmentation of all tattoo is usually unrealistic within one session. As we already know only part of the tattoo is fragmented and absorbed slightly. Hence not all tattoo pigments are reabsorbed after one tattoo fading procedure. Moreover, not all wavelengths are absorbed by the tattoo pigments and the tattoo fading mostly relies on the skin resurfacing effect to speed up the natural absorption process. Additionally, some tattoo pigment colours do not easily absorb a particular laser wavelength, therefore, being difficult to fade using laser treatments. In the picture below, the tattoo pigments are represented as being evenly located in the upper part of the dermis. This is an oversimplified representation of the tattoo pigments distribution. The tattoo pigments are seldom evenly distributed inside the dermis at the same depth. In reality, they are often found and distributed at different depths inside the dermis. Some part of the tattoo may have deeper or shallower pigments distribution depending on how the tattoo was drawn at the time and the type of pigments used. Oversimplified representation of laser pigmentation scattering. Rarely all pigments are scattered all at once. Although this is a rare occurrence, it can happen in case of fading dark colours and in high-quality tattoos like permanent make-up. Also, the distribution of the tattoo pigments is seldom uniform and can be uneven. Also, bear in mind that this is an oversimplified representation of the way laser treatments work for tattoo fading. Not only the tattoo pigments are affected by the laser, but also the skin undergoes a certain degree of burn caused by the laser treatment. The basic principle of laser tattoo fading is that the deep skin resurfacing caused by the laser forces some of the pigments to be reabsorbed by the immune system. This pigmentation absorption is a natural effect which occurs regardless of time. The deep intense burn caused by the laser speeds up the natural tattoo pigmentation fading. However as seen previously, this process is speeded up by tattoo fading procedures in general and in particular laser tattoo fading. Tattoo laser fading treatments are an example of where the overall treatment intensity is mainly determined by varying the settings of the laser device. 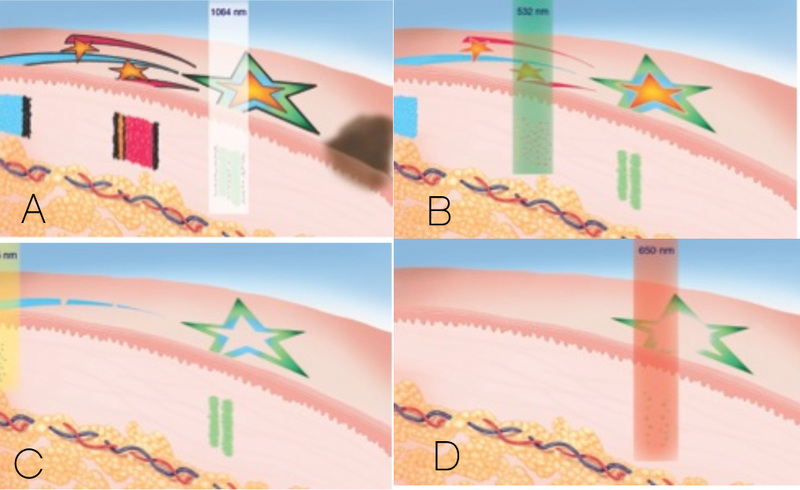 Although the user can intentionally increase the burn inflicted by overlapping the ablation spots while performing the treatment, the overall intensity is generally determined by the setting of the device. This is done by controlling the light emission using very short pulses (Q-Switching). This is one of the reasons for the feeling of being "hit by a strong elastic band" experienced by those who undergo laser fading treatments. The main principle of operation of tattoo fading lasers is represented in the figure below. These laser devices utilise the ¨Q-Switching¨method to generate an extremely short but highly intense coherent light pulse (generally in the order of nanoseconds). This light impulse is usually several orders of magnitude larger in intensity than lasers generating a constant output. The Q-Switching is the most used laser arrangement for tattoo fading. As seen in the figure the power is extremely high for a very short duration (nano seconds). This ensures that the intensity of the treatment is mainly determined by the way the device is set by the user and not by the way the hand-piece is used during the treatment. Pulse-width or pulse duration is a critical laser parameter. 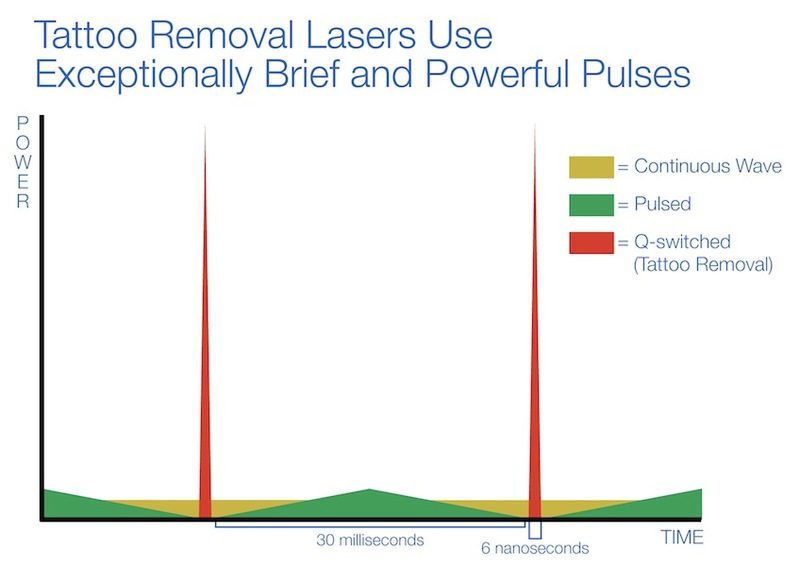 All Q-switched lasers have appropriate pulse durations for tattoo removal. 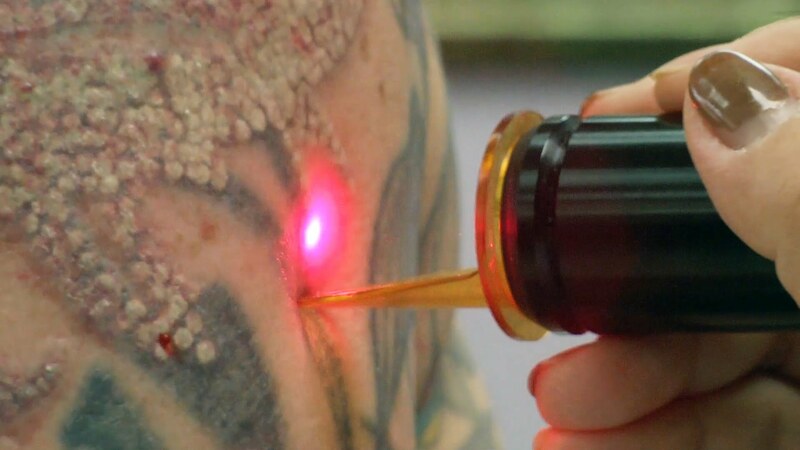 While using Q-Switching lasers, once the tattoo fading laser has been set up by the user, the operator needs only to make sure the spots do not overlap in order not to unintentionally doubling the burn inflicted on the same area. However this is quite easily avoided becuase every time the light hits the skin it leaves a clear "frosting" spot. In this way the laser treatment intensity is mainly controlled by the setting of the device and there is minimal margin of error during the treatment itself. In the video below we can see an example of a classic Q-Switched laser for tattoo fading treatment. As we can see there is the usual frosting characteristic of the laser tattoo fading. This frosting immediate reaction to the burn inflicted on to the skin caused by all laser tattoo fading devices. As we have seen the main principle of operation of tattoo fading devices is Q-Switching. As we can see in the figure below there are several types of Q-Switching devices used for tattoo fading, the lasers can be made to use Ruby, Alexandrite, YAG, or KTP. The material used in the core of the laser has only the effect to determine the main operational frequency of the Q-Switched laser. As we will see one of the main downsides to laser tattoo fading is the fact that lases cannot fade all colours in the same way. Some colours are almost can be impractical to be faded by lasers (especially certain green tones and very bright pigments). In this table, we can see the main four frequencies used in tattoo fading devices. All tattoo fading devices use the Q-Switching method. Some frequencies can target some tattoo colours only. On the right, we can see the types of colours targeted by each frequency. Some tattoo fading lasers are advertised as being capable of removing all colours and in one treatment only. These are lasers which combine more than one wavelength. The most common all-in-one tattoo removal lasers combine the four frequencies seen in the table above. However, despite the claims made by the manufacturers, unfortunately, laser tattoo fading treatment is fundamentally colour selective. This means that some colours are faded more than others. Most other tattoo fading treatments are colour blind, this means that they fade all colours indiscriminately. Some latest lasers are advertised to produce a high-intensity pulse lasting few picoseconds, however, no independent investigation on the actual way they operate, their true efficacy and the claims made by the manufacturers have not been verified. As we have seen most tattoo fading treatments, other than laser tattoo fading devices, are colour blind. Colour blind means that these treatments tend to fade all tattoo colour pigments indiscriminately. Unfortunately, in case of laser tattoo fading, different tattoo colours fade at different rates. Some colours are not easily absorbed and do not fade significantly after laser treatments, especially certain tones of green as bright colours. The relative light absorption of each tattoo colour is dependant on the specific wavelength of the light that hits the pigment.The graph shows the relative absorption of each fundamental colour versus the wavelength. 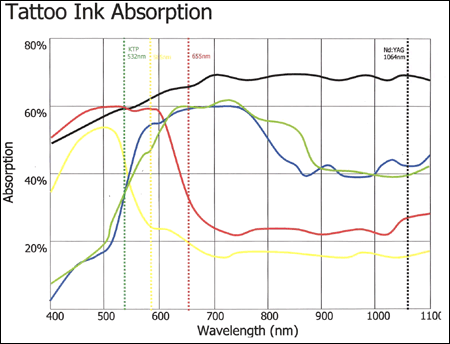 The above graph shows an estimation of the degree of relative light absorption of the tattoo pigments at each wavelength. This has not to be confused with the amount of pigmentation fading after each tattoo fading session. This is because although the light radiation may be absorbed by the particular pigments this does not necessarily translate into a proportional fading of the specific colour pigments. The figure is an oversimplification of the real effectiveness of tattoo colour fading due to laser treatment. The darker colours are the easiest to fade using lasers. 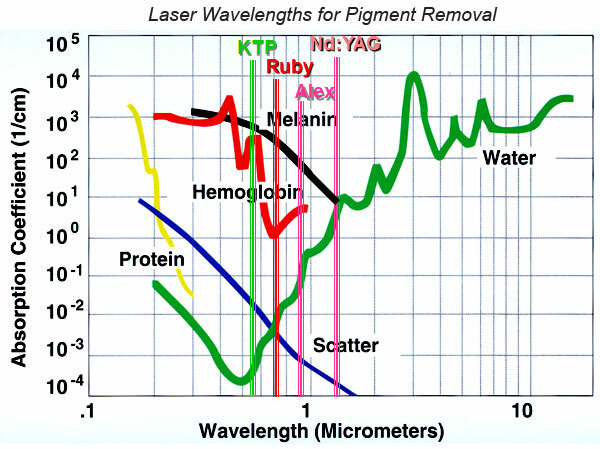 The above graph serves to show the fact that the inherent physics of light absorption of the tattoo pigments renders the laser treatment outcome inherently dependant on both the wavelength used and the tattoo colours. 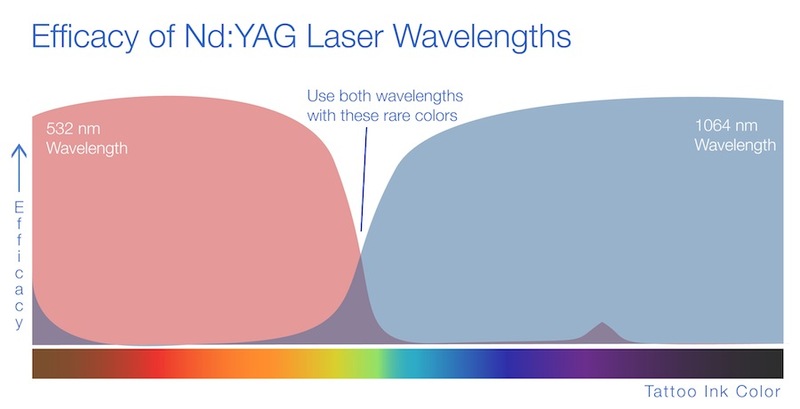 The figure on the left is meant to provide a rough idea of the challenges faced in fading certain colours versus others using tattoo fading lasers. As we can see the colour green is not even mentioned in this representative chart. This is because as it is well known in the industry lasers have little or no impact on the green tattoo colours. This does not apply to all tattoo fading treatments, in fact, this limitation only applies to laser tattoo fading. Due to the very nature of lasers, unfortunately, certain wavelengths are more effective on certain tattoo colours and cannot fade others. The easiest tattoo pigments colours to fade are black or dark colours in general, while bright and particularly certain tones of green pigments are the most difficult to fade. Generally the brighter the colours the harder they are to fade using lasers, conversely the darker they are the easier they are to fade using lasers. Sometimes green and bright colours will be far easier to cover up or remove using other treatments rather than persisting in the use of laser fading treatments, which have potential permanent adverse effects. 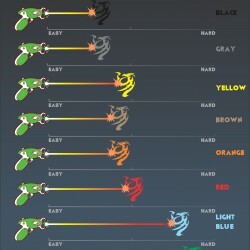 This figure is used only to illustrate what colours are the easiest and most difficult to fade using lasers. (A) represents the initial tattoo, (B) the initial fading of the tattoo after a few sessions, (C) the results after several sessions (where green and bright colours are left), (D) the most difficult colour to be faded is usually left last. Green is the most challenging colour to fade using lasers. The figure above illustrates how the first colours to be faded are black and dark tones. As we see in B, the easiest colours to be attenuated are the darkest, the brightest are usually left after the first few treatments. In C (after further tattoo fading treatments) the colours left are the brightest and green. Lastly, as seen in D, normally green is the most resilient tattoo pigment with laser tattoo fading. The colour green is so resilient to lasers that it is sometimes considered not feasibly faded using lasers. However, there are manufacturers claiming their new devices are capable of fading bright and all tones green colours indiscriminately. These claims have not been independently verified. Lasers are colour sensitive. This is a practical example showing how different colours fade at different rates when using tattoo fading lasers. Certain colours fade more than others. As a rule of thumb, with laser tattoo removal the hardest colours to fade are the brightest and especially green. Yellow and brightest colours still evident. The darkest colours have mostly all faded. Also, it is noticeable the colour scattering caused by the laser treatment. The figure above shows a practical example of laser tattoo fading and it demonstrates what we have said earlier, i.e. different colours fade at different rates. The type of tattoo shown is particularly colourful therefore it may be particularly challenging to fade using lasers. On the left, we can see this colourful tattoo at the beginning of the laser removal treatment. As seen on the right the tattoo has faded only slightly after a few lasers sessions, however, the brightest colours are the most resilient while the darkest ones including red have faded most. This figure illustrates the efficacy of two wavelengths on laser tattoo fading of certain colours. As we know not all colours fade in the same way after laser treatments. This representative graph shows there is an efficacy drop at the yellow-green colour. As it is well known these are the most difficult colours to be faded using laser tattoo removal. In particular, the figure above provides an estimation of the efficacy of two particular wavelengths in fading certain tattoo colours. Please bear in mind that this figure is only a rough representation which serves to illustrate the dependency of the wavelength with the efficacy of each specific tattoo colour. However, actual results may vary from the graph above because generally, the efficacy of lasers are good on dark tones despite the wavelength. The purpose of the figure above is to illustrate how the fading efficacy on individual tattoo colour is fundamentally dependent on the wavelength used. Different wavelengths fade pigment colours differently. As we can see from the graph, the hardest colours to fade are green, yellow and the brightest tones in general. Although there are other tattoo fading treatments which are colour blind, the resilience of green and bright colours have been addressed for years in laser tattoo fading treatments. This graph shows an estimation of the efficacy of each wavelength on tattoo individual colours. In order to increase the efficacy of lasers on particularly bright colours and green, other wavelengths have been introduced. This graph, in particular, shows how light radiation at 694nm has an increased efficacy on bright colours and green. Please note that despite the research and the numerous trials to increase the efficacy of fading green and bright pigments they are still challenging using lasers. These colours can be faded using alternative tattoo fading treatments which are not colour sensitive. Certain colours have proved more difficult to remove than others. In particular, this occurs when the tattoo is treated with an inappropriate wavelength. It has been shown that green ink tattoos somehow respond to treatments with 755 nm light and also to 694nm, 650nm and 1064nm. Some manufacturers have come up with multi-frequency lasers and their treatment intensity levels are particularly high compared to mono-frequency Q-Switched lasers. 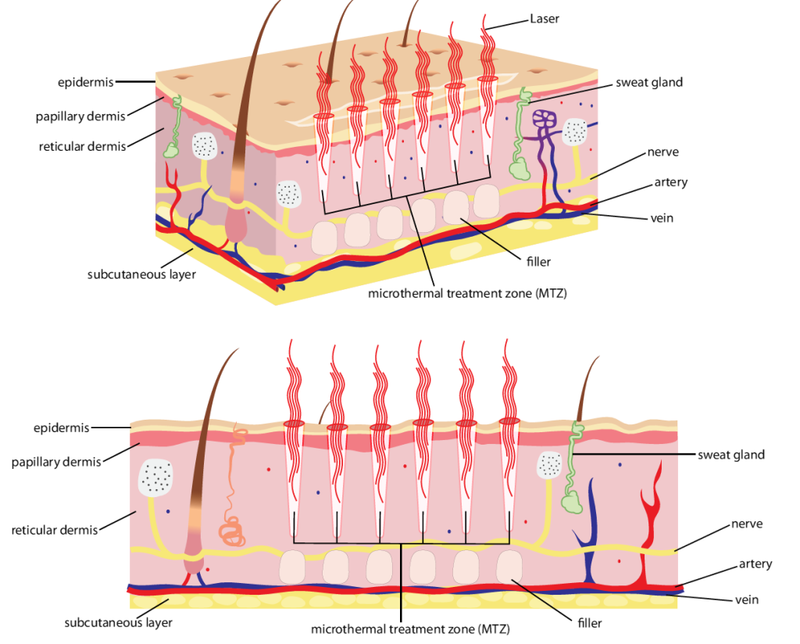 The result is that often, due to the high intensity of the multi-wavelength laser treatment most of the pigments fade dramatically, however, due to the deeper skin burn caused by the laser, there is usually an increased likelihood of undesired permanent adverse effects like hypo-pigmentation, permanent change in skin texture and permanent scars. Wavelengths vs absorption coefficient. This logarithmic graph provides further evidence of the colour sensitivity of lasers. A higher absorption coefficient does not necessarily translate in a proportional pigmentation fading rate. Q-Switched Alexandrite and Ruby operating at 755 nm and 694 nm. The weakest of all the Q-Switched devices, they generate an orange/red light which is highly absorbed by green and dark tattoo pigments. However, the alexandrite laser colour is slightly less absorbed by melanin, so Alexandrite laser has a slightly lower incidence of unwanted pigmentary changes than a ruby laser. This laser (Alexandrite) was reported to have some moderate effects on green tattoos, but because of its weaker peak power, it works only moderately well on black and blue ink. It does not work at all (or very minimally) on red, orange, yellow, brown, etc. This laser wavelength (755 nm) is also available in picosecond pulses (instead of the ordinary nanosecond) with unverified claims that it removes ink faster. Q-switched Nd:YAG: 1064 nm. This laser creates a near-infrared light (invisible to humans) which is also poorly absorbed by melanin, making this the only laser suitable for darker skin. This laser wavelength is also absorbed by all dark tattoo pigments and is the safest wavelength to use on the tissue due to the low melanin absorption and low haemoglobin absorption. This is the wavelength of choice for tattoo removal in darker skin types and for black ink. Dye modules are available for some lasers to convert 532 nm to 650 nm or 585 nm light which allows one laser system to treat multicolour tattoo inks. The role of dye lasers in tattoo removal is discussed in detail in the literature. As we know tattoo fading lasers are colour sensitive while other tattoo fading treatments which are colours blind. There have been several claims of outstanding effectiveness on all tattoo colours made by certain tattoo fading laser manufacturers, however, the inherent physics of lasers has its own limitations which appear hard to be overcome. 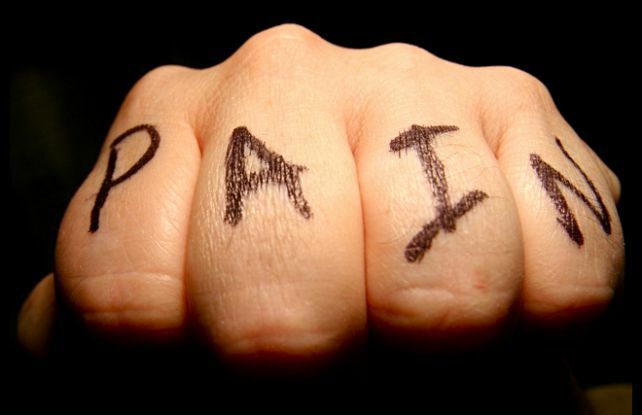 Pain caused by the treatment. Bleeding which can occur during the treatment itself. This is only minor and it subsides almost immediately on its own accord. Frosting. This is typical of tattoo laser treatments only. No other tattoo fading treatments present similar reactions other than cryotherapy, which is seldom used for this application. In the case or cryotherapy, the frosting is caused by the induced freezing of the skin. Blistering. Blistering is inevitable after tattoo fading laser treatments, it can only be somewhat minimised performing low-intensity treatments and with the use of potent topical soothing products immediately after the procedure. Associated to the blistering is the discomfort during healing. The level of discomfort depends on the intensity of the treatment, the sensitivity of the individual, and whether or not an appropriate soothing product was used. It is indeed the level of discomfort experienced during the treatment and during the days following the treatments associated with the relatively low rate of tattoo fading which sometimes discourage people from undergoing further treatments. Transient textural changes are occasionally noted but often resolve within a few months on their own accord; however, permanent textural changes and scarring can also occur. If a client is prone to pigmentary or textural changes, longer treatment intervals are recommended. Occasionally, "paradoxical darkening" of a tattoo may occur, when a treated tattoo becomes darker instead of lighter. This occurs most often with white ink, flesh tones, pink, and some cosmetic make-up tattoos. A local infection is always possible. The likelihood of this occurrence can be minimised by following the appropriate aftercare, especially avoiding puncturing or bursting the blisters. Photoallergic reactions. Local allergic responses to tattoo pigments have been reported. Allergic reactions to tattoo pigment scattering after Q-switched laser treatment are also possible because lasers by mobilizing the ink may trigger a systemic allergic response. Rarely, when yellow cadmium sulfide is used to "brighten" the red or yellow portion of a tattoo, a photoallergic reaction may occur. The reaction is also common with red ink, which may contain cinnabar (mercuric sulphide). Erythema, pruritus, and even inflamed nodules, verrucose papules, or granulomas may present. The reaction is usually confined to the site of the red/yellow ink. Oral antihistamines and anti-inflammatory steroids have been used to treat allergic reactions to tattoo ink also after photoallergic reactions to laser fading treatments. Laser tattoo fading treatments are inevitably painful. This is caused by the deep burn-induced during the laser treatment. One of the challenges of laser tattoo fading is the pain and discomfort during the treatment itself. Laser tattoo fading treatments are uncomfortable - many people say laser treatment is worse than getting the tattoo on. While the tattooing soreness is normally bearable, laser tattoo fading treatment is often reported to be unbearable. The pain is often described to be similar to that of hot oil poured on the skin (caused by the deep burn inflicted during the treatment), or a "snap" from an elastic band (caused by the high energy impulse generated by the Q-Switched laser). Depending on the person's individual pain threshold, some people can have the treatment done without using any form of numbing product, while others prefer to undergo the treatment using a topical anaesthetic (numbing cream). Please note that the use of local injectable anaesthetic is not required for this type of treatment because there are appropriate topical over the counter numbing products or effective topical products specially made for this and other aesthetic applications, which normally allow a pain-free treatment. Different numbing products have different efficacy and modality of application (follow the specific manufacturer's instructions). Hence local injectable anaesthetics are not required for this type of aesthetic procedure. Bleeding is a common immediate consequence of laser tattoo fading treatments. This is because the laser's high power impulses have to cause an ablation inside the dermis in order to be effective. A large number of capillaries are normally present inside the dermis, and the ablating power of the laser at the dermal level has the direct effect of breaking some of those capillaries hence causing some minor immediate bleeding. This is generally a very normal reaction and should not be interpreted as a sign or direct unintended harm caused by the treatments, but as a natural direct consequence of the treatment itself due to its very nature. Bleeding is a common and immediate reaction to most laser tattoo removal treatments. The degree of bleeding depends on the wavelengths used, the power level used by the impulsed of the Q-Switching laser and the individual's level of vascularisation of the treated area. Some areas may be more vascularised than others. Non-Q-Switched laser treatments, like CO2 or Argon lasers, which are very rarely offered these days, can rupture blood vessels and aerosolize (vaporise) tissue to such an extent that requires a plastic shield or a cone device to protect the laser operator from tissue and blood contact. Protective eye-wear may be worn if the laser operator chooses to do so. In any case, the bleeding is only minor, as the vessels broken during the laser treatment are only superficial capillaries. This minor bleeding stops a few minutes after the treatment. Also because of the likelihood of minor bleeding, one the of the recommendation made by the tattoo removal clinics is not take use any aspirin or blood thinning drugs before tattoo fading treatments (just to avoid slightly more prolonged bleeding). Laser tattoo fading procedures are quite painful, unfortunately, the pain and discomfort do not end there. While, as we have just seen the pain during the treatment is an easily solved problem with the use of appropriate topical numbing products, unfortunately, any laser treatment purposely inflicts a deep burn into the skin in order to fade the tattoo. Because of this skin burn, a direct consequence of every tattoo fading treatment is a fully fledged purposely inflicted burn injury which requires healing time. This burn is merely caused by the physics of the laser itself, although it can be somewhat attenuated, it cannot be avoided by varying the laser functioning parameters, by altering the laser design or modifying the treatment modality. Blistering is a normal reaction to laser tattoo fading treatments. Blistering can be minimised but never completely avoided. This is due to the very nature of the laser tattoo fading treatment which inherently inflicts a burn onto the skin in order to fade the tattoo. Depending on the area covered by the treatment and the intensity of the treatment, the extent of the skin burn caused by the laser can be significant at times. Having a relatively large and deep skin burn can be a very unpleasant and uncomfortable experience during the healing process. Like most skin burns, the direct effect of the laser tattoo fading treatments is blistering. The discomfort usually peaks when the blistering have fully formed. 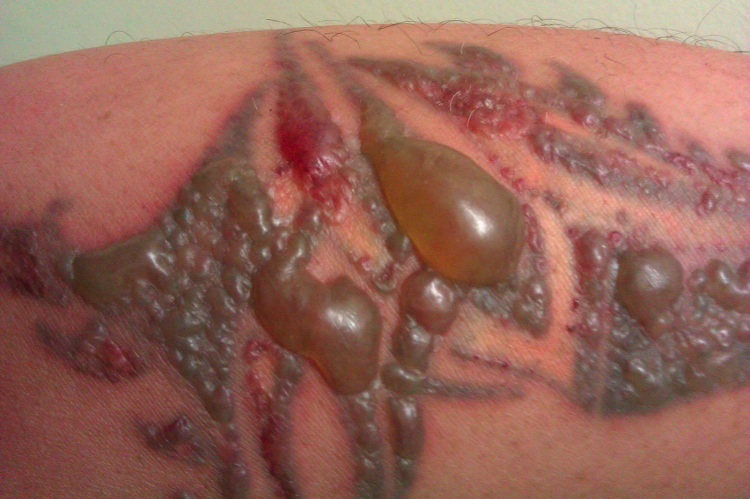 Example of moderate blistering after a mild tattoo laser treatment. 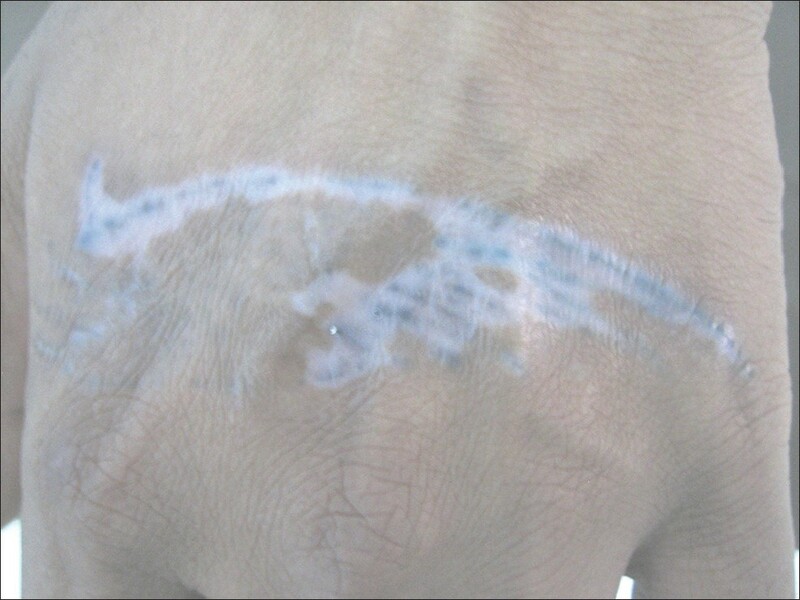 The skin reacts to the tattoo fading treatment as it would after any other skin burn. Blistering is one of the ways the skin reacts to deep and intense laser skin burns. Like any other skin burn, the discomfort lasts as long as the burn is still healing. The discomfort usually starts to subside of its own accord as the blisters heal, however, some degree of discomfort can persist even after the blisters have subsided and the treated tattoo has healed completely. In certain cases, the part may feel tender to the touch and over sensitive for several weeks, even after the blisters have subsided and the part has healed completely. The blisters increase in size proportionately with the laser treatment intensity. The higher the intensity the larger the blisters and the more the discomfort levels experienced during the healing process. One of the reasons for not treating wide tattoos all at once is to make the clients return for further treatments. The wider the area treated using lasers or the higher the intensity of the treatment, the larger the area subject to the skin burn, the higher the discomfort and pain experienced during the healing process. Additionally causing a skin burn over a relatively large area may have side effects like lethargy and other feverish-like symptoms which physiologically occur after large skin burns. Relatively large blisters caused by a laser high-intensity treatment. The higher the intensity treatment the larger the blisters and the more uncomfortable the healing process. Very often, the overall unpleasant experience sometimes deters the clients (incorrectly referred to as patients) from undergoing all the treatments required in order to completely remove or close to completely removing the tattoos. Sometimes, due to the discomfort levels, most people prefer to undergo the minimum number of laser tattoo fading treatments required, and then opting for tattoo cover-up as soon as pigmentation has faded enough to make it a feasible option. Blistering after lasers treatments can be minimised but never completely avoided due to the inherent physics of the laser tattoo fading treatment. The amount and size of blistering developed during the healing process depending on the intensity of the laser treatment. The higher the treatment intensity the larger the blisters and the longer it will take for the area to recover, conversely the milder the treatment the smaller the blistering sand the faster the recovery process. If the burn inflicted by the laser treatment is not too intense the area can heal normally and the tattoo will have faded slightly after the recovery period. In case of very high-intensity treatments the burn inflicted by the laser may as well remove most of all the tattoo pigments, however, the blistering will be very large and the likelihood of permanent adverse effects due to the treatment increases dramatically. A typical example of before, pictured during the blistering and after the area has recovered from the burn caused by the Laser. The blisters start to form 24 hours after the treatment, peak two to three days after the treatment and will gradually subside by their own accord. 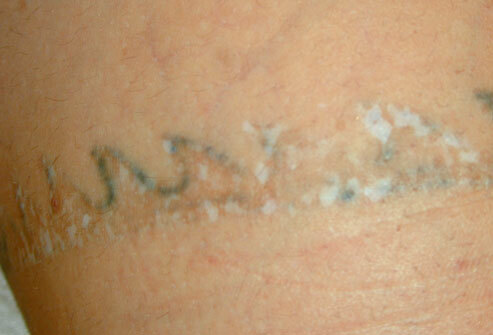 A further example of tattoo fading blistering after laser tattoo fading treatment. It is important not to interfere with the healing process of the blisters. In particular, the blisters must not be burst or pierced intentionally to avoid an increased likelihood of infections and other adverse reactions. For more information about the appropriate after-care for the blisters caused by the laser tattoo removal treatment please watch the video below. Uninformed clients sometimes expect that their unwanted tattoos will be completely removed within one session and with seamless results. This is very rarely possible using lasers tattoo fading treatments. Once the clients are informed about the real results of this type of aesthetic treatment, the first questions they will ask are the number of sessions required and how much it will cost them to achieve the best tattoo fading results. Ultimately, these two questions are inextricably linked. The total cost of the laser removal treatment will be the number of sessions times the cost per session. No matter what their qualifications or their expertise, no aesthetic practitioner can predict for certain exactly how many sessions it will take to achieve the clients' desired results. Because there are several factors that will determine the number of sessions required. Before a patch testing is carried out, all an experienced tattoo removal practitioner can do is provide an educated estimation. Anyone who claims to provide the exact number of treatments for a complete and seamless tattoo removal is probably trying to sell something based on false promises. Complete laser tattoo removal often requires numerous treatment sessions, typically spaced at least seven weeks apart. Treating more frequently than seven weeks increases the likelihood of adverse effects and does not necessarily increase the rate of ink absorption. Anecdotal reports of treatments sessions spaced less than seven weeks (four weeks) lead to more scarring and hypo-pigmentation and could increase liability for clinicians (especially in case an appropriate consent form is not in place). At each session, only a fraction of the tattoo pigments is effectively fragmented and faded over the following weeks. Remaining large particles of tattoo pigment are then targeted at subsequent treatment sessions, causing further lightening. The number of sessions and spacing between treatments depends on various parameters, including the area of the body treated and skin colour. Tattoos located on the extremities, such as the ankle, generally take longest. Aesthetic practitioners may recommend that clients wait many months between treatments to facilitate ink resolution and minimise the likelihood of unwanted adverse effects. In the vast majority of cases, satisfactory results are achieved after several sessions and the results are seldom seamless. In general, the number of sessions required to achieve satisfactory fading results can vary from 6 to 15 depending on several factors. Some tattoos can be particularly easily removed and completely seamless removal can be achieved in one or two sessions (this is generally the case of certain high-quality permanent make up tattoos), however, this is not the norm. Most tattoos can be extremely resilient and it may be even impractical or not advisable to try and achieve complete removal. Some laser tattoo removal manufacturers claim their latest devices remove all tattoos within one session without adverse permanent reactions, these claims are unverified. While certain tattoos are easily removed in few sessions (especially permanent makeup), despite the claims made by laser manufacturers, there is no evidence that all tattoos can be removed within one treatment without leaving a visible scar, hypo-pigmentation or another type of permanent skin texture change. Seamless complete tattoo removal is more the exception than the norm, especially due to the way tattoos have been originally drawn. In case of particularly resilient tattoo pigments, a certain degree of tattoo fading will be regarded as a good result because complete removal without leaving any scar or permanent skin texture may be unlikely. The intensity of the treatments. Like any other type of tattoo fading procedure the higher the intensity of the treatment the more the degree of tattoo fading after each session and therefore the fewer sessions required to achieve satisfactory fading. On the other hand the higher the intensity of the treatment the higher the likelihood of permanent undesired adverse effects like hypo-pigmentation, permanent change in skin texture and scarring. Conversely, the milder the treatment intensity the less the tattoo fades after each treatment and therefore more sessions will be required. A number of wavelengths used by the device. This is peculiar to laser tattoo fading treatments only. As we know, lasers are devices that can emit a discrete number of wavelengths at a time (either one, two, three etc). Some manufacturers have devised multi-frequency lasers which can emit a number of different frequencies all at once. This is in an effort to eliminate all or most tattoo colours as quickly as possible. Multi-wavelengths tattoo fading lasers have a generally natural tendency to fade the tattoos more than mono wavelengths frequency lasers. This is because of the more the wavelengths used by the laser, the higher the treatment intensity and the more the tattoo will fade after each session. As the intensity of the treatment increases so inherent likelihood of permanent adverse reactions increases. Conversely, mono wavelengths (or mono-frequency lasers) will fade the tattoo to a lesser extent after each treatment. Tattoo colours. As it is well known, unlike other tattoo fading treatments, lasers fade colours at different rates and some colours can be particularly challenging to be faded. Therefore more colourful and bright tattoos are the more challenging they will be and more sessions will be required. Whereas darker tattoos may require fewer treatments to achieve satisfactory fading. Skin tone. The darker skin tones are more prone to develop hypo-pigmentation after laser treatments. For this reason, the darker the skin tone the milder the laser treatment is required to be in order to try and avoid this occurrence. Since hypo-pigmentation is the only reason the tune down the intensity of the laser treatment and other types of fading treatments do not usually display this type of adverse reaction, darker skin tones may benefit from other typed of tattoo fading treatments which do not lead to hypo-pigmentation. Sometimes estimations based only on previous experience can be completely unreliable. The best way to estimate the number of sessions required in order to achieve the desired results is an extrapolation after appreciating the results of a patch test or after the first session. This is because every tattoo is different and there is seldom little background information about the tattoo itself and the way it was originally made. There are several factors which determine the number of sessions required in order to achieve the desired results. Factors influencing this include skin type, location, colour, amount of ink, scarring or tissue change, tattoo layering etc. Since the number of laser tattoo sessions required to achieve the desired results is a frequently asked question, a predictive scale, the "Kirby-Desai Scale", was developed by Dr Will Kirby and Dr Alpesh Desai, dermatologists with specialization in tattoo removal techniques, to assess the potential success and number of treatments necessary for laser tattoo removal, provided the medical practitioner is using a Q-switched Nd: YAG (neodymium-doped yttrium aluminium garnet) laser incorporating selective photothermolysis (i.e. the use of light produced by lasers to produce heat damage) with six weeks between treatments. 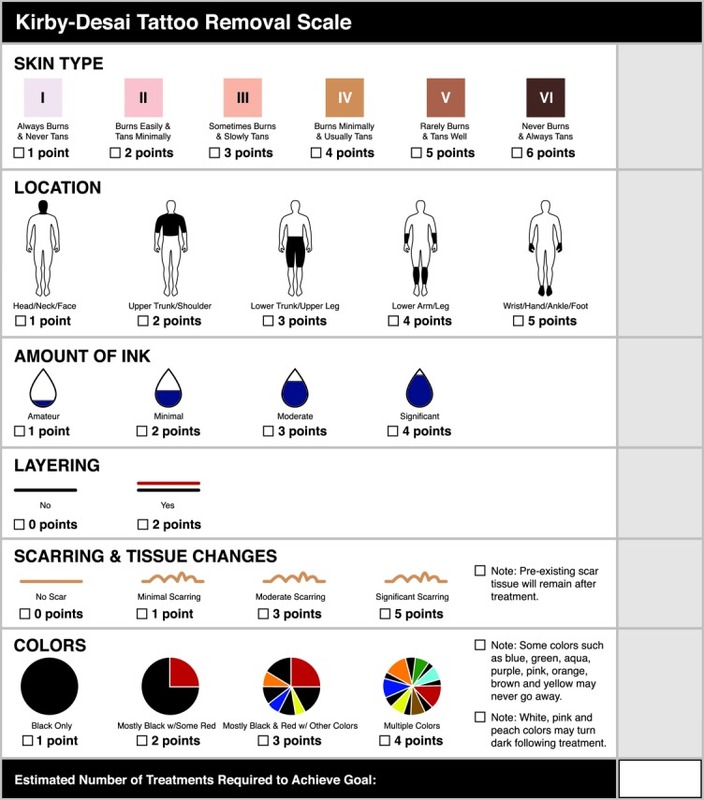 The Kirby-Desai Scale assigns numerical values to six parameters: skin type, location, colour, amount of ink, scarring or tissue change, and layering. Parameter scores are then added to yield a combined score that will show the estimated number of treatments needed for satisfactory tattoo fading. Some recommend that the Kirby-Desai scale is used by all laser practitioners prior to starting tattoo removal treatment to help estimate the number of treatments required for tattoo removal and as a predictor of the success of the laser tattoo removal treatments. Prior to 2009, clinicians had no scientific basis (other than patch testing) by which to estimate the number of treatments needed to remove a tattoo and the use of this scale is now standard practice in laser tattoo removal. The video below serves to provide an example of the real fading results achievable after mild laser tattoo fading treatments. This video can serve to manage the clients' expectations when first undergoing tattoo fading treatments. At first sight, most laser tattoo removal advertisements seem to promise seamless total tattoo fading results. Marketers should not be blamed for this initial misconception about laser tattoo removal procedures, because this is what attract people in the first place. Marketing the real results and the real expectations from the laser treatments would not be very effective and could deter people from inquiring about the treatment to start with. Unfortunately, marketing campaigns focusing on the real results are not very effective in the commercial world, especially when at first sight all the major clinics suggest seamless removal results. Therefore the common initial expectation of the uninformed client is the complete and seamless removal of their tattoos within one easy session. However, as we know, this is seldom the reality of laser tattoo removal treatments results as also demonstrated by the terms of business presented prior to the treatments. Example of common tattoo removal advert. These are designed to capture the audience attention, however, these claims cannot reflect what it is currently possible to accomplish in reality. As a matter of fact, there are currently no laser tattoo removal devices or techniques which can guarantee consistent seamless results. It is sometimes possible to remove certain types of tattoos using lasers within one or very few sessions, however this is the exception and not the norm; also very high-intensity treatments make tattoo fading possible for most tattoos in very few sessions however this does increase the likelihood of causing intense skin burns which will lead to permanent very visible adverse reactions (mainly scars, hypo-pigmentation and permanent skin texture change). When the pigments are located too deeply into the dermis or in case of multi-layered tattoos seamless removal may be highly unlikely in any case. This is because the ablation has to be carried out so deeply inside the dermis in order to remove all the pigmentation that the likelihood of permanent adverse reactions is very high. Usually, these types of tattoos can be faded to a certain extent, however complete disappearance is very unlikely. More generally as a rule of thumb, the higher the points on the Kirby-Desai scale the more unlikely a complete seamless removal will be. Conversely, the lower the points the more likely a seamless removal will be. An example of low points tattoo is permanent make-up, usually removed within one or two sessions. As we know, laser tattoo fading treatments consist in inflicting a skin burn on the tattooed area in order to scatter the colour pigments. The skin does not react well both in the short and long-term to skin burns. Therefore, due to the very nature of this type of aesthetic treatment, seamless results after a complete removal are more the exception than the rule. Aware of the high likelihood of permanent adverse reactions to the laser treatment, very few cosmetic clinics are willing to guarantee seamless results, despite the claims (implicit or explicit) made during the advertising campaigns. This is because experienced aesthetic practitioners are very well aware of the nature of laser treatments as well as what it is to be expected from this type of tattoo fading treatments. The real expected results also emerge in the informed consent forms, which clinics use in order to minimise their potential liabilities due to the permanent real adverse reactions. Often there may be skin texture change which can be permanent, hypo-pigmentation, colour scattering, a trace of the previous pigmentation or the tattoo will not be completely removed as it may be impractical to do so without leaving a scar tissue. Hypo-pigmentation. 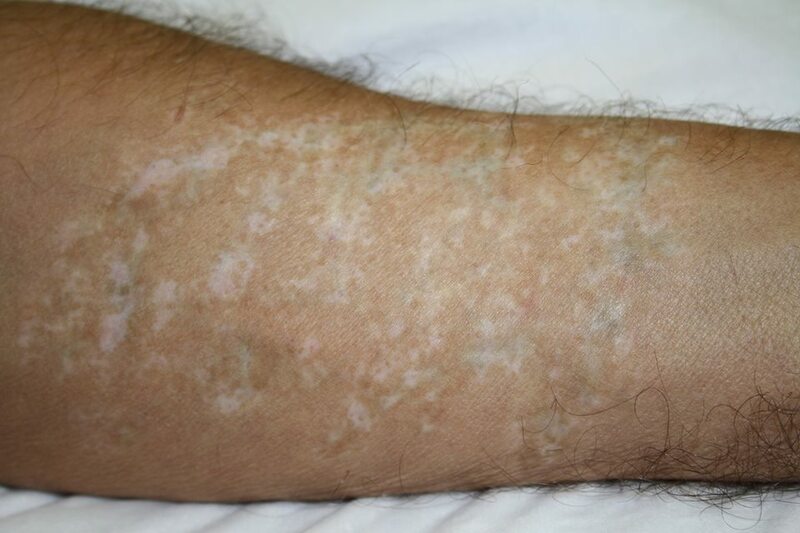 Hypo-pigmentation associated with some sort of skin texture change is the most common permanent long-term adverse effect of burns caused by lasers. It does not usually occur after other tattoo fading treatments. Hypo-pigmentation associated with some sort of skin texture change is the most common permanent long-term adverse effect of burns caused by lasers. The likelihood of hyperpigmentation is exacerbated in dark skin types, and this is the reason for many mild treatments to be used on dark skin tones. Some clinics even prefer to avoid laser treatments on skin type 4, 5 and 6. Aesthetic cosmetic laser treatment is sometimes avoided on skin types 4, 5 and 6 altogether to due to the likelihood of hypopigmentation. Those clinics which would perform laser treatments on these darker skin tones perform very mild treatments, in order to minimise the likelihood of hypo-pigmentation. Especially in darker skin tones, the likelihood of hypo-pigmentation is so high that some cosmetic clinics do not suggest laser treatments at all. In case of dark skin, the aesthetic practitioner may still inform the clients of the inherent potential adverse reactions (especially hypo-pigmentation) and if the clients agree they perform the least invasive laser treatment to minimise the risks of hypo-pigmentation even if the number of treatments required to achieve the desired results increases dramatically (sometimes exceeding 2o treatments in case of resilient tattoos). Hypo-pigmentation is very likely to occur especially after intense multi-wavelengths or very high-intensity treatments. It can sometimes be temporary, however, it is mostly permanent. Many people prefer to have hypo-pigmentation rather keeping their unwanted tattoo. Hypo-pigmentation is sometimes resolved with permanent camouflage make-up (another form of tattooing). Hypo-pigmentation left after tattoo fading treatment. Some blue pigments are still present. Most hypo-pigmentation are permanent, however, this type of hypopigmentation will fade slightly over time. On the other hand, the skin texture will unlikely completely blend with the rest of the skin. Hyperpigmentation. This can occur because the tattoo fading treatment also triggers skin regeneration. As it is well known, exposure to sunlight without sun protection can cause hyperpigmentation. In certain cases, some light colours such as yellow or white can become dark. This paradoxical darkening can lead to an aesthetic change. These colours can be removed with other laser sessions. Permanent skin texture change. This occurs especially after intense laser treatments. Wrinkled appearance or slight effect of depth on the skin in the case of 3D tattoos. This is a common characteristic of laser tattoo fading treatments and can also occur after other types of tattoo fading treatments. Can cause scars especially hypertrophic. The likely of hypertrophic scars development is exacerbated by high-intensity treatments using multi-wavelengths lasers. However, the main cause of permanent scarring is poor after-care or predisposition to scarring. This type of adverse reactions can occur after any type of tattoo fading treatments. Keloid formation. This can also occur after any other type of tattoo fading treatment. Incomplete, even impossible, elimination of all traces of tattoo ink. Polychrome tattoos, in particular, pastel colour, yellow and dense or deep tattoo pigmentation particularly hard to be faded completely. A phantom tattoo (residual traces) can be observed at the end of the course of several treatments. Phototoxicity of certain types of tattoo pigments. Some tattoo pigments contain metals that could theoretically break down into toxic chemicals inside the body when exposed to light (including that of lasers). This has not yet been reported in vivo but has been shown in laboratory tests. The higher the intensity of the treatment the more the tattoo pigmentation is scattered by the treatment, however the more the likelihood of developing adverse permanent adverse reactions due to the deep burn caused by the high-intensity laser treatment. Conversely, the milder the treatment, the milder the burn inflicted, the less the pigmentation scattered and the lower the likelihood of developing permanent adverse reactions after each individual treatment. For this reason, most cosmetic clinics prefer to split the removal treatment into several low-intensity treatments. Not only does this minimise the inherent likelihood of developing adverse reactions but it also increases the overall price of the tattoo fading treatment due to the increased cumulative cost of several sessions. It has to be reminded that although mild treatments minimise the likelihood of adverse reactions, due to the cumulative skin damages caused by the laser burns also a high number of laser treatments can lead to adverse effects. In other words, because the cumulative damage of several relatively mild laser burns can cause similar adverse permanent reactions to one or few intense laser treatments. Please note that any permanent adverse reaction can occur regardless of the way the treatment has been performed. Sometimes even one relatively mild laser treatment can trigger one or more adverse reactions. 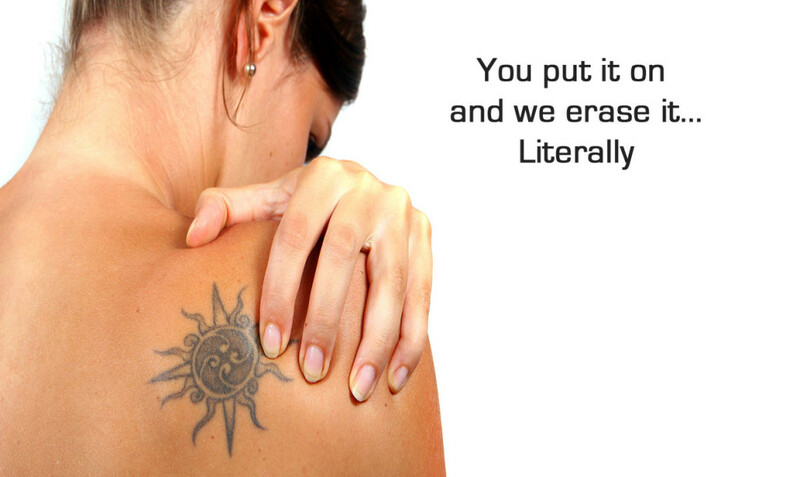 Unfortunately, there is not currently known tattoo fading treatment capable of guaranteeing seamless tattoo removal. In this section, we can see some real results of laser tattoo fading (removal) procedures. Of course in some cases where the tattoo has a low score in the Kirby-Desai scale the results can be seamless, however, this is not the reality of most tattoo fading treatments, especially those who have a high Kirby-Desai score. The more challenging the tattoo to remove, i.e. the higher the points on the Kirby-Desai scale the more likely the removal of the tattoo pigments will come at the price of some type of adverse reaction. We mainly present those results which display hypo-pigmentation because this is the most common permanent adverse reaction to laser tattoo removal treatments. Not all laser fading procedures will present adverse reactions and some tattoos can be removed seamlessly, however, this is only the case of high-quality tattoos, and those tattoos with a low score of the Kirby-Desai scale. Typical hypo-pigmentation and change in skin texture after intense laser treatment. Hypo-pigmentation is an adverse reaction only peculiar to laser treatments, so far it has not been reported after any other type of tattoo fading treatment. Hypo-pigmentation is usually permanent however slowly gets better over time. Normal pink hypo-pigmented skin is found after the normal healing of most wounds. The type of permanent hypo-pigmentation caused by laser treatments should not be confused with the normal temporary lack of melanin after a normal wound heal. This is because unfortunately, laser treatments seem to have the inherent tendency of either permanently destroying the melanocytes or somehow permanently inhibit the natural production of melanin. Scattered hypo-pigmentation caused by laser treatment. Typically, this is an inherent risk which can be unavoidable at times. The darker the skin type the higher the likelihood of developing hypo-pigmentation after tattoo laser fading treatments. As seen in the figure above the lack of melanin can occur in random patches on the area treated by the laser. The higher the intensity of the treatment, the higher the likelihood of this type of adverse effect. Hypo-pigmentation is more difficult to be removed or attenuated than most other types of adverse reactions to laser tattoo fading treatments. This is because the inherent lack of melanin although can improve slightly over time, is permanent and there are not currently known methods to restore the natural melanin production after it has been inhibited by the laser burn. While hyperpigmentation, scarring, keloids and certain types of skin texture change can be successfully treated in various ways, hypo-pigmentation can improve slightly over time on its own accord but unfortunately, there are not known aesthetic treatments to reverse it. The most common solution to hypo-pigmentation is tattoo cover-up or permanent make-up. Hypo-pigmentation and variation is skin tone and texture, in general, is a very common permanent skin reaction to laser tattoo treatments. In the figure above we can see how the brightest colours are still present after 5 laser treatments. Permanent camouflage makeup is a good solution for those areas rarely exposed to the sunlight. Because exposure to the sun will naturally darken the healthy normal skin, while the hypo-pigmented area will not change in colour, therefore exposure to the sunlight and artificial tanning may accentuate the aesthetic problem even after the use of cover-up tattoos or permanent makeup. Therefore tattooing the hypo-pigmented areas with another colour to blend in the hypopigmented area is the most common solution to this adverse reaction. A further example of hypo-pigmentation. As we can see some pigmentation traces are still present. 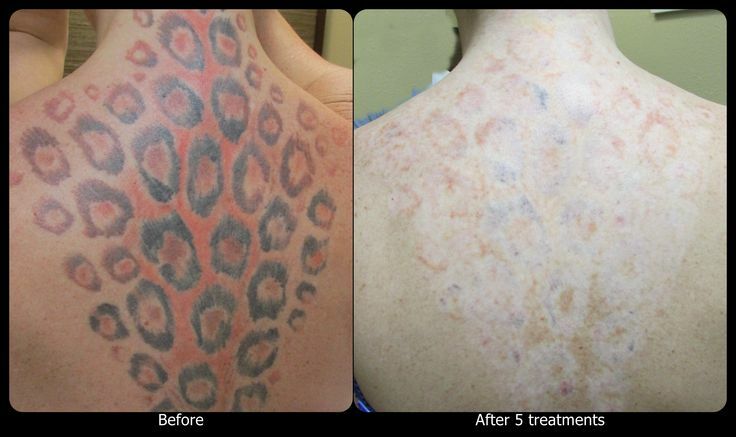 The following experience is brought as an example to show the actual results of laser "tattoo removal" treatments are. As you will see in these three videos the healing process is accompanied by blistering and it is uncomfortable. In third video the "picture" advertised as safe and more effective than common lasers has caused blistering lasting 5 days and possibly due to the high-intensity treatment, the last session left a certain degree of hypo-pigmentation. We have chosen these videos because they are a true testimony of what clients go through after the laser removal treatments. As you can see in these videos the immediate and temporary normal reactions are those described previously in this web-page (blistering and discomfort). In this video, you can see the real results of a treatment performed with an expensive heavily advertised tattoo fading/"removal" laser the "picture". There are several more published videos on the social media and all show similar experiences.